BIRMINGHAM, England (AP) Defending champion Petra Kvitova raced impressively into the Birmingham Classic final on Saturday with a 6-3, 6-2 win against Mihaela Buzarnescu. Fourth-seeded Kvitova outplayed one of the most improved players on the tour with strident groundstrokes and uninhibited net attacks. Buzarnescu, an unseeded Romanian, fought back to 2-3 by breaking the Czech’s serve and briefly seemed capable of the kind of resistance that earned her the first set in their well-contested final in Prague last month. That, however, was on clay – and on grass right now Kvitova looks better than anyone. If she maintains this high level for another three weeks, everything seems possible for the player whose career looked seriously in doubt 18 months ago after a knife attack at her home in December 2016. The result earned Kvitova her 36th victory of the year, more than any other player on the tour after overtaking the previous leader, top-ranked Simona Halep. ”I didn’t expect that at the start of the season,” Kvitova said. ”I didn’t start well in Australia, but now I can’t imagine a better season so far. After breaking serve twice in the first set, Kvitova broke twice more in the second, unafraid to take risks by hitting so flat and hard that her margins for error were often very small. Buzarnescu did chisel out two break back points for herself three games before the end, but on the second of these Kvitova found such an extraordinary angle from so far back, with a full-blooded flat backhand, that the ensuing winner brought spectators to their feet. She will need to do that in Sunday’s final against Magdalena Rybarikova. Rybarikova, a grass-court expert whose career was at risk of ending after wrist and knee surgeries, overcame Barbora Strycova 7-6 (1), 6-4 to reach the Birmingham final for a second time. It was further proof of a remarkable recovery for the Slovak from a ranking of 453 early last year, which has been followed by a Wimbledon semifinal and a chance of regaining a title she won nine years ago. Strycova, a top 30 Czech who ousted Wimbledon champion Garbine Muguruza in the second round, had won their last four meetings and had her chances to win a fifth. She broke serve to lead 5-3 in the first set, and then broke to lead 4-3 in the second set with her serve to follow. Each time she got to 30-15 in the following game, only to make mistakes, though this was still an impressive display between two players fully comfortable on the surface. 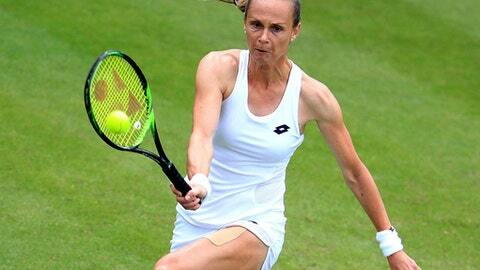 Rybarikova sliced well, approached the net confidently, and often volleyed very well.